The TLM generator automatically generates an IP-XACT file that complies with IEEE® Standard for IP-XACT 1685-2009. You can find this file in the same folder as the generated makefile. Mapping information between Simulink® and the generated TLM component. Metadata specific to MathWorks® and the model. This data is intended primarily for reference, but it is required when importing the file for TLM generation. You can combine inputs and outputs in a single bus interface definition, but you cannot mix parameters and I/O. 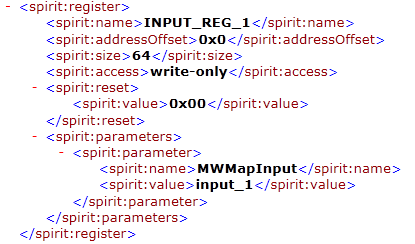 These elements are defined in a <spirit:parameter> name-value pair. This example from a generated IP-XACT file shows Simulink mapping without a memory map. In each bus interface with a memory map, the Simulink mapping is expressed in the memory map, not in the bus interface. The bus interface definition, <spirit:busInterface>, contains a <spirit:parameter> name-value pair indicating that there is a memory map in use for the interface. You can combine inputs and outputs in a single bus interface definition, but you cannot mix parameters and I/O. 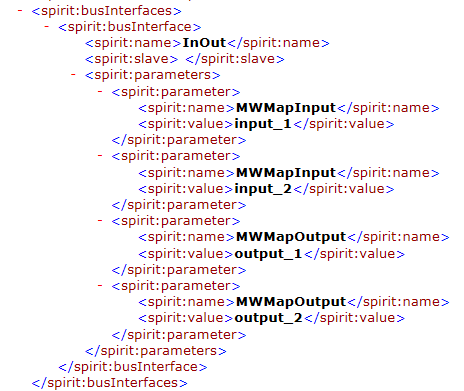 Each component definition, <spirit:component>, contains information specific to MathWorks and the model. This information is located within a <spirit:parameter> element, specified with the <spirit:name> and <spirit:value> tags. If you plan to import the generated IP-XACT file for use with the TLM generator, these fields are required. This example shows the metadata in a generated IP-XACT file.